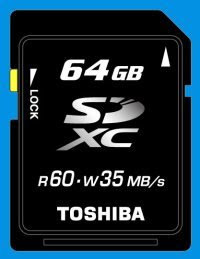 Toshiba said Monday it expects to be the first to bring SDXC cards to market, with testing samples of a 64GB version shipping in November and the real thing shipping in the spring of 2010. Those dates will be key moments in what doubtless will be a gradual transition away from the prevailing SDHC standard. SDXC backers promise higher capacities and data transfer speeds for SDXC, which is important for devices such as video cameras that can produce lots of data at a sustained rate. But initially, a new generation of Toshiba's SDHC line will match the SDXC's maximum 60MBps data-reading speed, and maximum 35MBps data-writing speed, the company announced, using a new high-speed interface called UHS104. The fast new SDHC cards, though, will only be available in 16GB and 32GB models. SDHC tops out at 32GB, but the SDXC specification extends to 2TB. In addition, through use of Microsoft's exFAT files system on SDXC cards, individual files can exceed 4GB, which is important for longer videos. Capacity is undeniably important when it comes to carrying your video camera around for extended periods of time. But do you really need all that Motransfer speed? Leaving aside the confusing muddle of minimum vs. maximum transfer speeds and certification, even high-definition video only pushes the envelope so hard. For example, Canon's high-end 5D Mark II SLR, which can record 1080p video at 30 frames per second, requires only a relatively modest 8MBps write speed for its CompactFlash card; high-end CompactFlash today can handle 45MBps. Of course, there's also the matter of transferring photos and videos to computers, a tedious task at best that benefits from maximum speed. But that's often constrained, though, by the card reader and its interface to the computer.